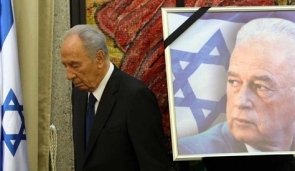 President Shimon Peres at a memorial ceremony for former Prime Minister Yitzhak Rabin. Today marked the 15th Anniversary of the assassination of Prime Minister of Israel, Yitzhak Rabin. On November 4, 1995 Rabin was shot to death by a Jewish assassin, at the end of a mass demonstration in Kikar Malchei Yisrael Square in Tel Aviv in support of the peace process. Yitzhak Rabin (1922- 1995) was an Israeli politician and general. He was the fifth Prime Minister of Israel, serving two terms in office, 1974–1977 and 1992 until his assassination in 1995. In 1994, Rabin won the Nobel Peace Prize together with Shimon Peres and Yasser Arafat.